I have been busy painting gargoyles, so thought I would make them the subject of this weeks post. What is a gargoyle, where are they and why are they there? The word gargoyle comes from the middle English word "gargule" and the old French word "gargoulle" both words meaning throat and thought to refer to the noise (gargling) of water rushing from the waterspouts. The gargoyle disguises a waterspout that directs rain water, collected from the roof of a building, away from the sides of that building. So they started out as a way of "decorating" the old leaden pipes used as drains on exterior walls of buildings. They were whimsical, fanciful, slightly scary and sometimes downright ugly carved pieces of stone. Gargoyles are grotesques. Grotesques can also be called chimera. Here is one of my recent paintings, I saw and photographed this one in Paisley, Scotland. I don't think it is a true gargoyle, but it could be. It appears to be part cat, part bird and part lizard or dragon. I haven't thought of a name for this one yet but it is a watercolour. 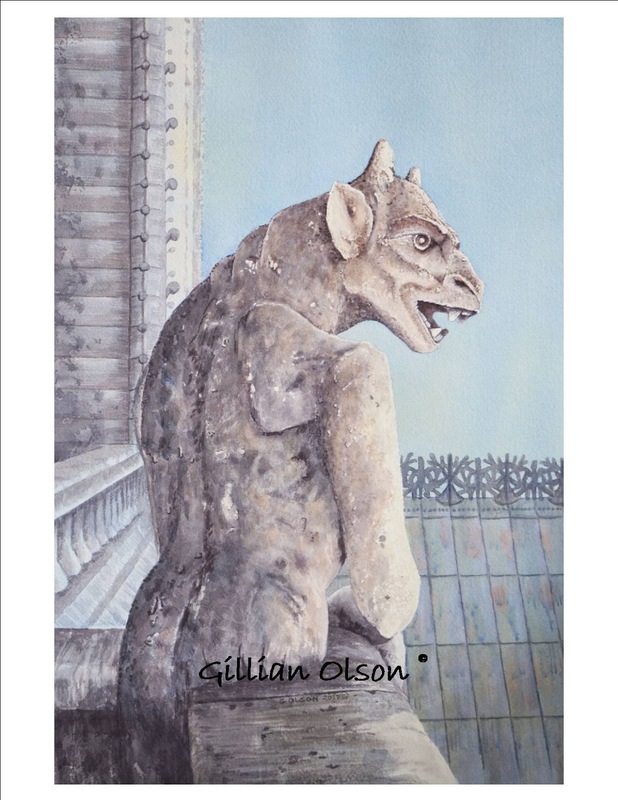 "Many medieval cathedrals included gargoyles and chimeras. The most famous examples are those of Notre Dame de Paris. Although most have grotesque features, the term gargoyle has come to include all types of images. 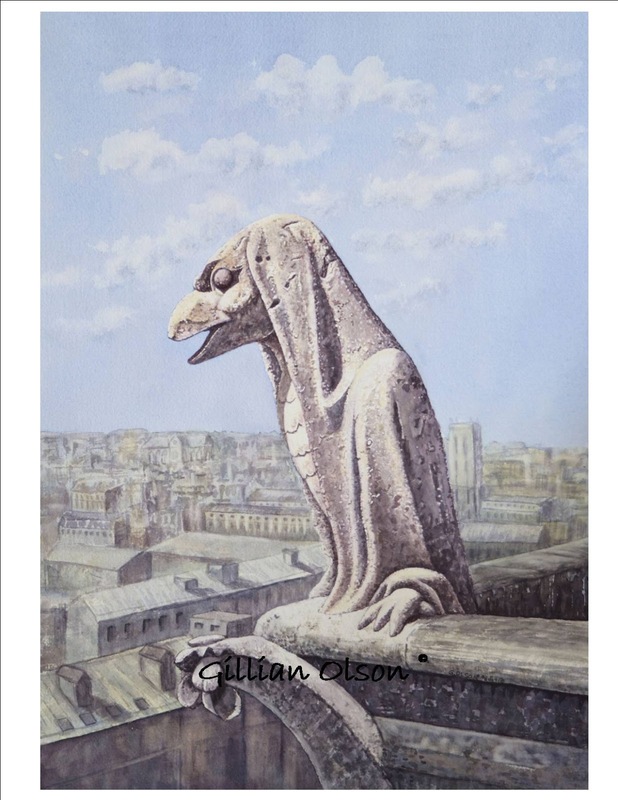 "During the 12th century, when gargoyles appeared in Europe, the Roman Catholic Church was growing stronger and converting many new people. Most of the population at this time were illiterate, and therefore images were very important to convey ideas. Many early gargoyles depicted some version of a dragon, especially in France. In addition to serving as spouts for water, the gaping mouths of these gargoyles evoked the fearsome destructiveness of these legendary beasts, reminding the laity of the need for the church's protection." 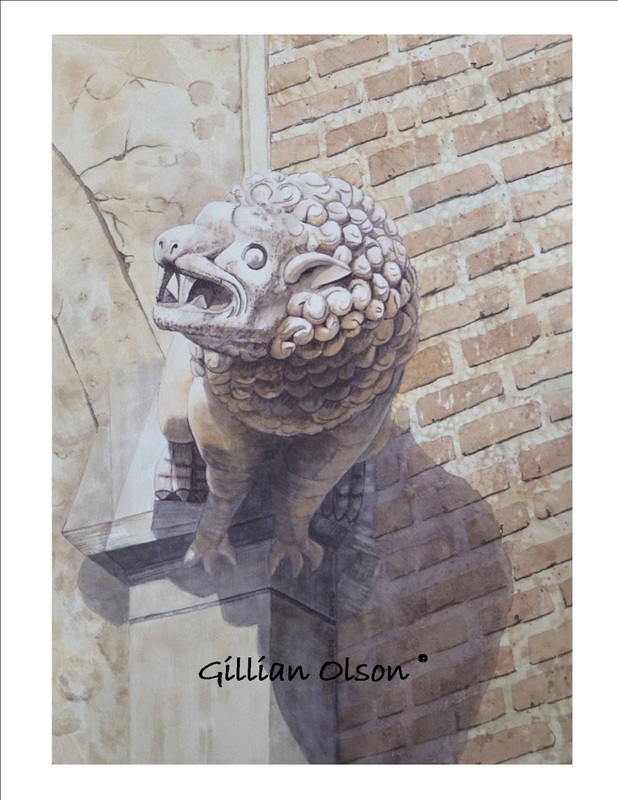 My second painting today is of a chimera or grotesque from Albi, France. This one is from the Catherdral Sainte-Cecile, which has the distinction of being the largest brick church in the world. I think it is a wolf in sheep-wool disguise, what do you think. Of course it is a watercolour. 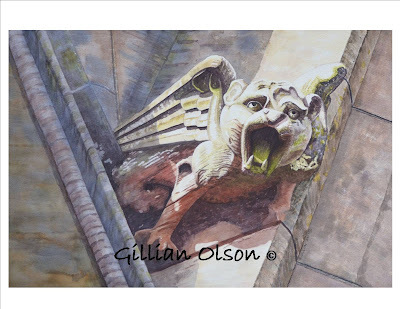 My last painting today is of a chimera or grotesque from the Notre Dame Cathedral in Paris, France. Green Sea turtles are the largest hard shell sea turtles. Sightings are not rare in Hawaii, but neither are they abundant; I was excited every time I encountered one of these gentle creatures. They can be seen in the water around reefs, grazing on algae in shallow water or on the shoreline soaking up some sunshine. "The green turtle is listed as endangered by the International Union for the Conservation of Nature. In 1978, the Hawaiian population of the green turtle was listed as threatened under the U.S. Endangered Species Act of 1973. " "Green turtles were a source of food, tools, and ornamentation for early Hawaiians. With the arrival of western culture, however, the level of exploitation of this resource increased dramatically. Large numbers of green turtles were harvested throughout the Hawaiian Islands through the nineteenth and early twentieth centuries. In 1974, the State of Hawaii finally passed a regulation providing some protection, but this was virtually ignored until 1978, when the Hawaiian green turtle was placed on the list of threatened species." "In other parts of the world, green turtles face a serious threat from the destruction and loss of nesting sites. Fortunately, over 90% of nesting activity for the Hawaiian green turtle population occurs at the French Frigate Shoals, inside a National Wildlife Refuge System administered by the U.S. Fish and Wildlife Service. This, combined with its threatened status under the U.S. Endangered Species Act, has created an environment in which the Hawaiian green turtle should prosper." This is a longer video and at the end the turtle yawns (I think)? That is it for turtles today. I have been busy very busy painting and gardening recently, the garden is coming along, now just need some slightly warmer weather. I have completed a number of paintings, unfortunately I have only photographed one of them. It is a painting (watercolour) of a grotesque or chimera, most would recognize it as a gargoyle but since it does not drain rain water it isn't a true gargoyle. This one is high up on Notre Dame Cathedral in Paris. It is an odd bird or penguin like creature in a shroud.